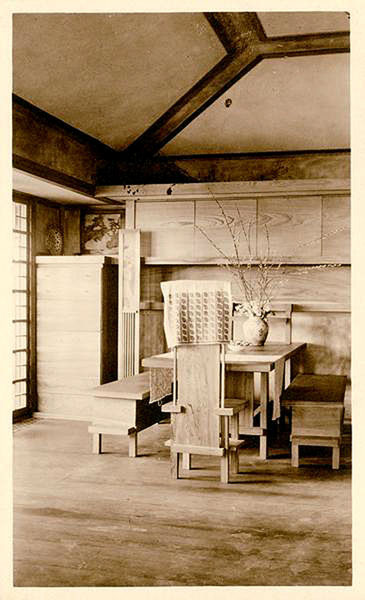 Even before his trip to Japan, Wright had an interest in Japanese prints. Wright lent one of his prints to an exhibit of Suzuki Harunobu’s work held at the Caxton Club on February 4, 1905 in the Fine Arts Building, Chicago. With his forthcoming trip in mind, the exhibit afforded Wright the opportunity to connect with wealthy collectors and inform them of his upcoming voyage. Ten days later, on February 14, 1905 Frank Lloyd and Catherine Wright departed Oak Park for a trip to Japan. They headed west, and one week later departed from Vancouver, BC on the Empress of China with Ward and Cecilia Willits (1901 - S.054). After two weeks at sea, they arrived in Yokahama, Japan on March 7th. For seven and a half weeks they toured Japan, finally arriving back to Oak Park during the middle of May. While in Japan, Wright invested heavily in Japanese Prints as well as other items. One year later Wright exhibited over two hundred Hiroshige woodcut colour prints at The Art Institute of Chicago from March 29 through April 18, 1906, entitled "Hiroshige. An Exhibition of Colour Prints from the collection of Frank Lloyd Wright". He also purchased Japanese paper while in Japan which Wright used for the exhibition catalog. The solo exhibition was a first for Wright and for Hiroshige’s work. Two years later Wright loaned over two hundred prints to an extensive exhibition of Japanese Colour Prints from March 5-25, 1908, again at The Art Institute of Chicago, titled "A Loan Exhibition of Japanese Colour Prints". The committee in charge, and major contributors, were Clarence Buckingham, Frederick W. Gookin, J. Clarence Webster and Frank Lloyd Wright. It was the largest exhibit of Ukiyo-e prints ever displayed in America. 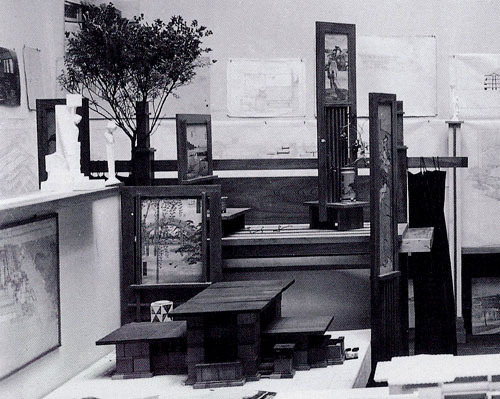 Wright designed the exhibition installation for the Art Institute. Wright’s display consisted of a long horizontal panel suspended above the ground, secured on each end by a pair of vertical pedestals. 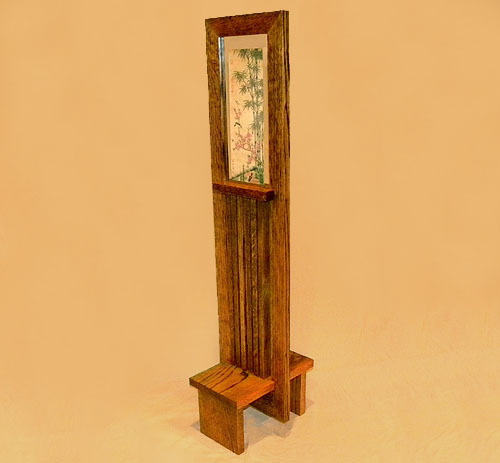 Included with the designs for the exhibition was a Japanese Print Easel or Stand. The print was held in a tall vertical frame that intersected the base, and floated above the surface it was placed on. The low base was designed to hold a small vase for flower arrangements or other decorative items. The overall design was very consistent with Wright’s prairie style. Although very vertical in appearance, this first Print Stand appears to be about three feet in height and was designed to be placed off the ground at eye level. 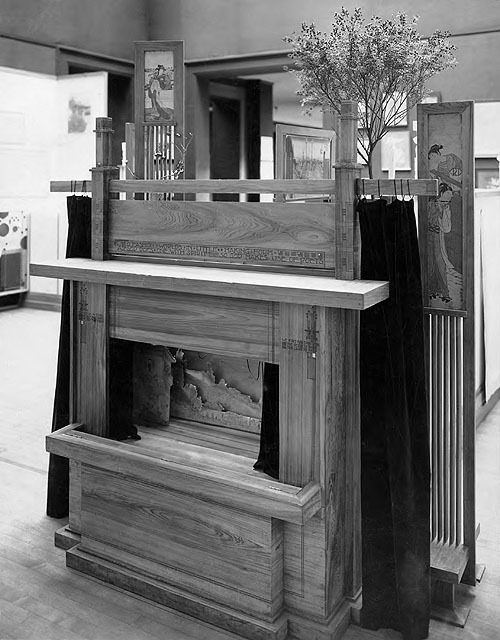 A taller variation, approximately six feet in height, and designed to set on the floor, appeared in the Taliesin Photograph Album from 1911. It was placed in the Dining Room at Taliesin I. Wright began building Taliesin I in 1911. On August 15, 1914, it was destroyed by fire. On January 28, 2005, the Wisconsin Historical Society acquired the album that included important photographs documenting Taliesin I between 1911-1912. One of those photographs included this image of the Dining Room. Courtesy of the Wisconsin Historical Society. variations. The two taller floor versions are seen on the far left and the right. The shorter table top version is to the right of center. Not seen before are the two desk top versions seen in the foreground on the left, and behind it in the background. By 1915, Wright had placed two additional taller floor Print Stands in the Living Room at Taliesin II. 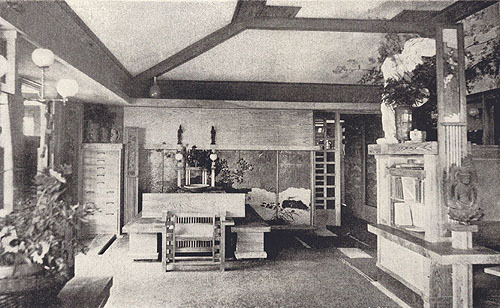 "The Architectural Record", October, 1915, published the first interior photograph of Taliesin II. This was taken after rebuilding from the fire of August 15, 1914, but before August, in time to go to production for publishing in October, 1915. Most likely photographed by Henry Fuermann and Sons (see image two) in July or August, 1915. Courtesy The Architectural Record. The second Print Stand, seen on the right, is setting on the built in shelf. On the base is a Japanese figurine. The third Print Stand on the far left, is obscured in this photograph. A second photograph, taken from a slightly different view, clearly shows the three tall floor Print Stands, especially the one on the far left. Photographed by Henry Fuermann and Sons, dated incorrectly, but courtesy of the Wisconsin Historical Society. Taliesin II was photographed again by Henry Fuermann and Sons circa 1917-1919, clearly showing three Print Stands. There are many similarities which date the 1915 image and this image close together. The vase on the top shelf in the far left corner. Many items decorating the dining room table are exactly the same. The print and print stand on the far right atop the end table are the same. But there are also subtle changes that would date it at a later time. The adjustable wall lamp on the left has been adjusted differently and has been adorned. The print stand on the left has been moved. The ceiling in the far left corner has added triangles. The figurine that was on the far right has now been moved to the dining table centerpiece. The small throw rug that was running horizontally just to the right of the dining table is now placed vertically. The Winged Victory model on the right has been replaced by a vase. The book shelves are now full of books. The third print stand that was on the left has been moved to the right as well as matching wall lamp on the right. A pelt has also been draped over a chair on the far right as well as the dining room bench on the left. There are many more plates and vases. In April 1925, fire struck Taliesin again and destroyed the living quarters. Wright rebuilt again, expanding and enlarging the Dining and Living Room. Whether damaged in the fire or moved to a different location, they are not evident in the photograph. Of interest is the Sherman M. Booth Residence (1915 - S.187) adaptation of the Print Stand as a Floor Lamp. Booth, Wright’s attorney and a developer, first approached Wright in 1911 to design an elaborate home in Glencoe, on Chicago’s North Shore. Wright was asked to scale back the design, and in 1915 the Booth Residence was constructed, along with three sculptures (S.185.1-185.3), a bridge (S.186) and five other homes (S.188-192). Built for the Residence in 1915, the Lamp measures sixty-five inches high, 10 inches wide and 14 inches deep. Constructed of mahogany, the shade is a silk fabric, with the horizontal element just below the Print was enlarged to form a shelf below the shade just above mid point. The base is a different design. 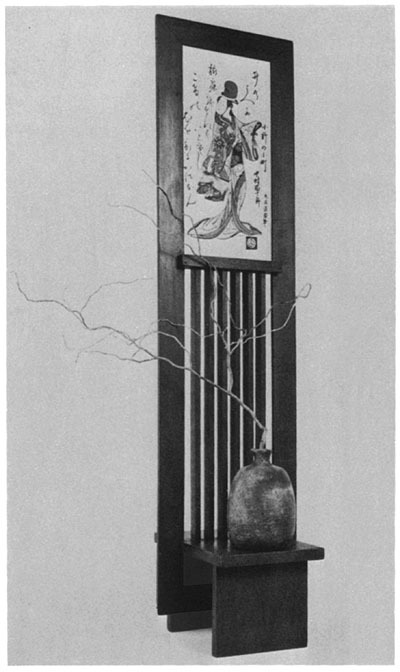 Wright designed an additional Floor Lamp variation for the Henry J. Allen House, Wichita, Kansas, "Decorative Designs", Hanks, p128. In November, 2010 my son-in-law, James C. Rust gave us a table top version of the Print Stand. Not having original plans to work with, he created a very accurate adaptation of the shorter table top Print Stand. Thirty-six inches in height, eight in width and twelve inches in depth, it is made of oak, stained with walnut, and coated with a satin finish. What once was an obscure two dimensional element has come to life as a detailed three dimensional object illustrating the mind of Frank Lloyd Wright. 1A: 1908. Wright loaned over two hundred prints to an extensive exhibition of Japanese Colour Prints from March 5-25, 1908, at The Art Institute of Chicago, titled "A Loan Exhibition of Japanese Colour Prints". The committee in charge, and major contributors, were Clarence Buckingham, Frederick W. Gookin, J. Clarence Webster and Frank Lloyd Wright. It was the largest exhibit of Ukiyo-e prints ever displayed in America. Wright designed the exhibition installation for the Art Institute. Wright’s display consisted of a long horizontal panel suspended above the ground, secured on each end by a pair of vertical pedestals. Courtesy of the Art Institute of Chicago. 1B: 1908. Detail of the exhibition display designed by Frank Lloyd Wright. 2A: 1908. 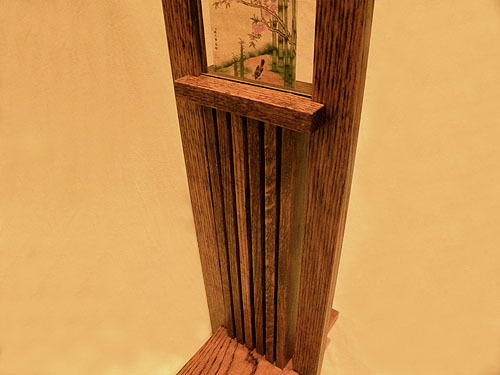 Included with the display designs for the exhibition was a Japanese Print Easel or Stand. Courtesy of the Art Institute of Chicago. The Print Stand consisted of a tall vertical frame that intersected the base, and floated above the surface it was placed on. The low base was designed to hold a small vase for flower arrangements or other decorative items. The overall design was very consistent with Wright’s prairie style. Although very vertical in appearance, this first Print Stand appears to be about three feet in height and was designed to be placed off the ground at eye level. Courtesy of the Art Institute of Chicago. 2B: 1908. Detail of the Print Stand designed by Frank Lloyd Wright. It consisted of a tall vertical frame that intersected the base, and floated above the surface it was placed on. The low base was designed to hold a small vase for flower arrangements or other decorative items. The overall design was very consistent with Wright’s prairie style. Although very vertical in appearance, this first Print Stand appears to be about three feet in height and was designed to be placed off the ground at eye level. 3: Circa 1908. 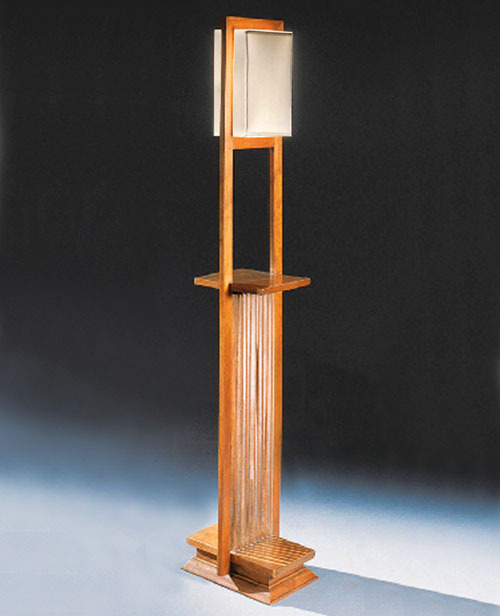 The Frank Lloyd Wright designed Print Stand consisted of a tall vertical frame that intersected the base, and floated above the surface it was placed on. The low base was designed to hold a small vase for flower arrangements or other decorative items. The overall design was very consistent with Wright’s prairie style. Although very vertical in appearance, this first Print Stand appears to be about three feet in height and was designed to be placed off the ground at eye level. Dining Room, Taliesin I, 1911. 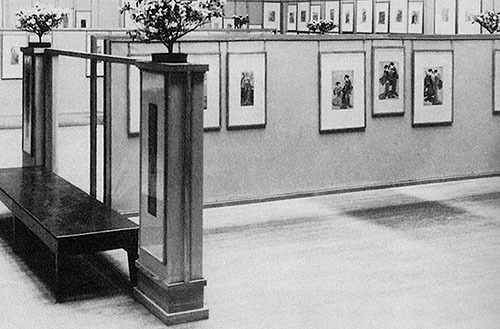 A taller variation of the Print Stand, approximately six feet in height, and designed to set on the floor, appeared in the Taliesin Photograph Album from 1911. It was placed in the Dining Room at Taliesin I. Wright began building Taliesin I in 1911. On August 15, 1914, it was destroyed by fire. On January 28, 2005, the Wisconsin Historical Society acquired the album that included important photographs documenting Taliesin I between 1911-1912. One of those photographs included this image of the Dining Room. Courtesy of the Wisconsin Historical Society. 1: The Art Institute of Chicago in 1914. 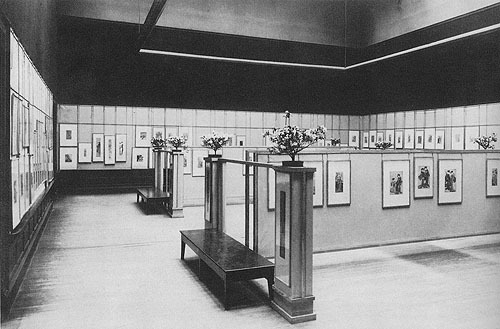 The Print Stand was displayed again at an exhibition of Wright’s work entitled "The Work of Frank Lloyd Wright" at The Art Institute of Chicago in 1914. 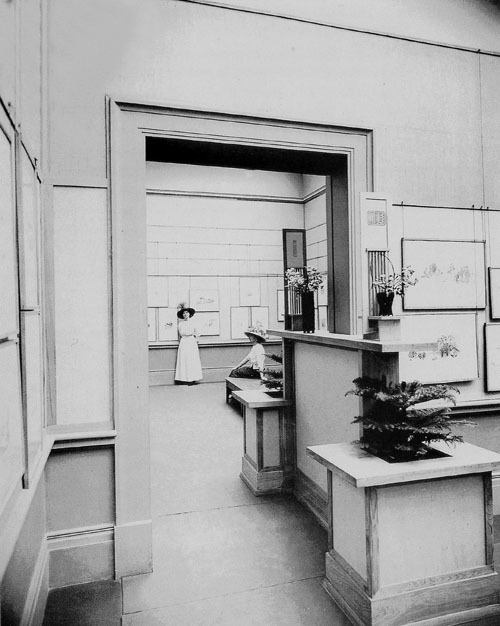 The photograph documenting the exhibition features a Puppet Theater designed in 1908 for his son Llewellyn. The engraved masque reads, "To Fashion Worlds in Little - Making Form As God Does One With Spirit - So God Makes Use Of Poets", an adaptation of a passage from Richard Harvey's "Taliesin". Of note, this quote was used three years before Wright began building Taliesin I in 1911. Also visible in the photograph is a Coonley Playhouse window (1912 - S.1912) and three Print Stands. The shorter version seen on the left behind the Puppet Theater, the taller version seen on the right, and a shorter desk top version in the center. Of interest is the addition to the base, possibly modified to increase stability and compensate for the height. Courtesy of the Frank Lloyd Wright Preservation Trust. 2: The Art Institute of Chicago in 1914. Reverse side of the Puppet Theater. There are five Print Stands visible in this image. The two taller floor versions are seen on the far left and the right. The shorter table top version is to the right of center. Not seen before are the two desk top versions seen in the foreground on the left, and behind it in the background. Photographed by Henry Fuermann & Sons. Courtesy of the Frank Lloyd Wright Archives, Scottsdale. Dining Room, Taliesin II, 1915. By 1915, Wright had placed two additional taller floor Print Stands in the Living Room at Taliesin II. 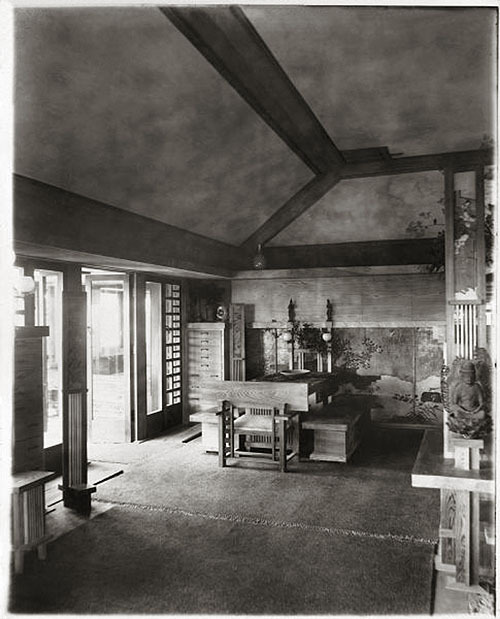 "The Architectural Record", October, 1915, published the first interior photograph of Taliesin II. This was taken after rebuilding from the fire of August 15, 1914, but before August, in time to go to production for publishing in October, 1915. Most likely photographed by Henry Fuermann and Sons (see image two) in July or August, 1915. Courtesy The Architectural Record. The second Print Stand, seen on the right, is setting on the built in shelf. On the base is a Japanese figurine. The third Print Stand on the far left, is obscured in this photograph. A second photograph, taken from a slightly different view, clearly shows the three tall floor Print Stands, especially the one on the far left. See next image. Dining Room, Taliesin II, 1915. Three tall floor Print Stands are clearly seen in this second image. The third Print Stand on the far left, which was obscured in the first photograph, is clearly visible. Photographed by Henry Fuermann and Sons, dated incorrectly, but courtesy of the Wisconsin Historical Society. 1: Dining Room, Taliesin II, Circa 1917-1919. 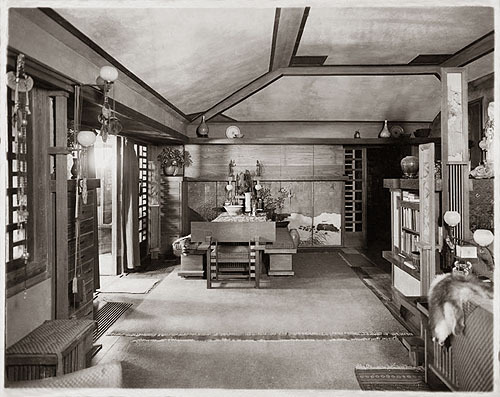 Taliesin II was photographed again by Henry Fuermann and Sons circa 1917-1919, clearly showing three Print Stands. There are many similarities which date the 1915 image and this image close together. The vase on the top shelf in the far left corner. Many items decorating the dining room table are exactly the same. The print and print stand on the far right atop the end table are the same. But there are also subtle changes that would date it at a later time. The adjustable wall lamp on the left has been adjusted differently and has been adorned. The print stand on the left has been moved. The ceiling in the far left corner has added triangles. The figurine that was setting on the base of the Print Stand on the far right has now been moved to the dining table centerpiece. The small throw rug that was running horizontally just to the right of the dining table is now placed vertically. The Winged Victory model on the right has been replaced by a vase. The book shelves are now full of books. The third print stand that was on the left has been moved to the right as well as matching wall lamp on the right. A pelt has also been draped over a chair on the far right as well as the dining room bench on the left. There are many more plates and vases. 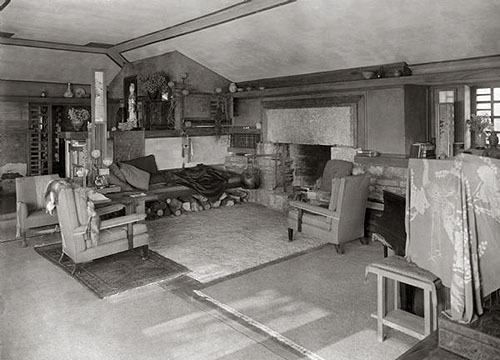 2: Living Room, Taliesin II, Circa 1917-1919. This image of Taliesin II was photographed very close to the photograph above by Henry Fuermann and Sons. Minor changes include moving the two chairs on the left, and one the Print Stand that was setting on the floor in the above photograph. 1: During November, 2010 my son-in-law, James C. Rust gave us a table top version of the Print Stand. Without original plans to work with, he created a very accurate adaptation of the shorter table top Print Stand. The print was held in a tall vertical frame that intersected the base, and floated above the surface it was placed on. The low base was designed to hold a small vase for flower arrangements or other decorative items. The overall design was very consistent with Wright’s prairie style. Thirty-six inches in height, eight in width and ten inches in depth, it is made of oak, stained with walnut, and coated with a satin finish. What once was an obscure two dimensional element has come to life as a detailed three dimensional object illustrating the mind of Frank Lloyd Wright. 2: The print was held in a tall vertical frame that intersected the base, and floated above the surface it was placed on. The overall design was very consistent with Wright’s prairie style. 3: The print was held in a tall vertical frame that intersected the base, and floated above the surface it was placed on. The low base was designed to hold a small vase for flower arrangements or other decorative items. 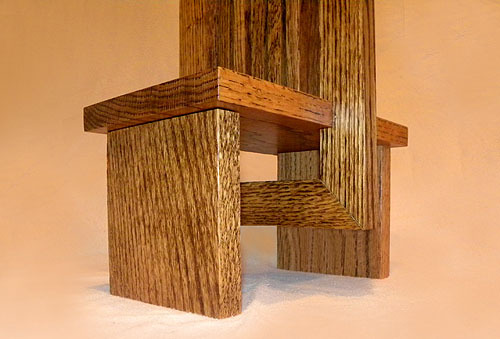 Eight inches in width and ten inches in depth, it is made of oak, stained with walnut, and coated with a satin finish. Of interest is the Sherman M. Booth Residence (1915 - S.187) adaptation of the Print Stand as a Floor Lamp. Booth, Wright’s attorney and a developer, first approached Wright in 1911 to design an elaborate home in Glencoe, on Chicago’s North Shore. Wright was asked to scale back the design, and in 1915 the Booth Residence was constructed, along with three sculptures (S.185.1-185.3), a bridge (S.186) and five other homes (S.188-192). Built for the Residence in 1915, the Lamp measures sixty-five inches high, 10 inches wide and 14 inches deep. Constructed of mahogany, the shade is a silk fabric, with the horizontal element just below the Print was enlarged to form a shelf below the shade just above mid point. The base is a different design. Courtesy of Christie's. Copyright Douglas M. Steiner unless otherwise noted. The Caxton Club of Chicago, 1895. "Hiroshige: An Exhibition of Colour Prints from the collection of Frank Lloyd Wright", Wright, 1906. "The Art Institute of Chicago. Catalogue of a Loan Exhibition of Japanese Colour Prints March 5 to March 25 1908", AIC, 1908. "The Architectural Record", October, 1915, Pages 385-395. "In The Nature of Materials: 1887 - 1941", Hitchcock, 1942, plate 177. "Frank Lloyd Wright to 1910", Manson, 1958, Page 40. "Taliesin 1911-1914: Wright Studies Volume 1", Menocal, 1992, Pages 48-49, 108-111. 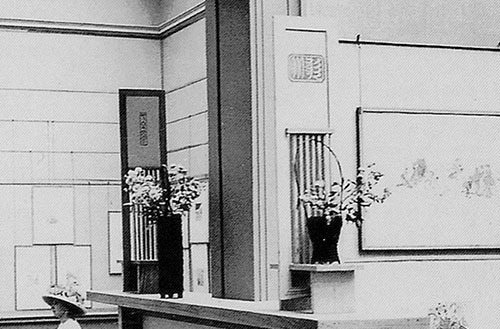 "Frank Lloyd Wright’s Fifty Views of Japan", Birk, 1996. "Sherman M. Booth House", 1999, Poster of Scheme 1. 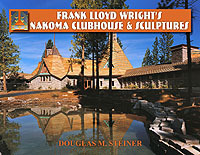 "Frank Lloyd Wright and the Art of Japan", Meech, 2001, Pages 57-61,106-110. "Frank Lloyd Wright: Graphic Artist", Fowler, 2002, Pages 25-30, 45-48. Wisconsin Magazine of History, Autumn 2005, "An Ebay Coup", Holzhueter, Pp 46-51. "Decorative Designs", Hanks, 1979, Page 128. Additional information about Wright and Japan.